March 15, 2016 – Mercury’s surface is unusually dark, an observation that until recently had planetary scientists mystified. But in a new study published last week in Nature Geoscience, a team of researchers provides evidence that the darkening agent is carbon, a finding that offers important clues to the nature of the planet’s original crust. Patrick Peplowski, a research scientist at the Johns Hopkins University Applied Physics Laboratory (APL) in Laurel, Maryland, and lead author of the paper, explains that earlier measurements of the chemistry of Mercury’s surface only added to this mystery because they indicated that Mercury’s surface has low abundances of iron and titanium, important constituents of the most common darkening agents on the Moon and other silicate bodies. 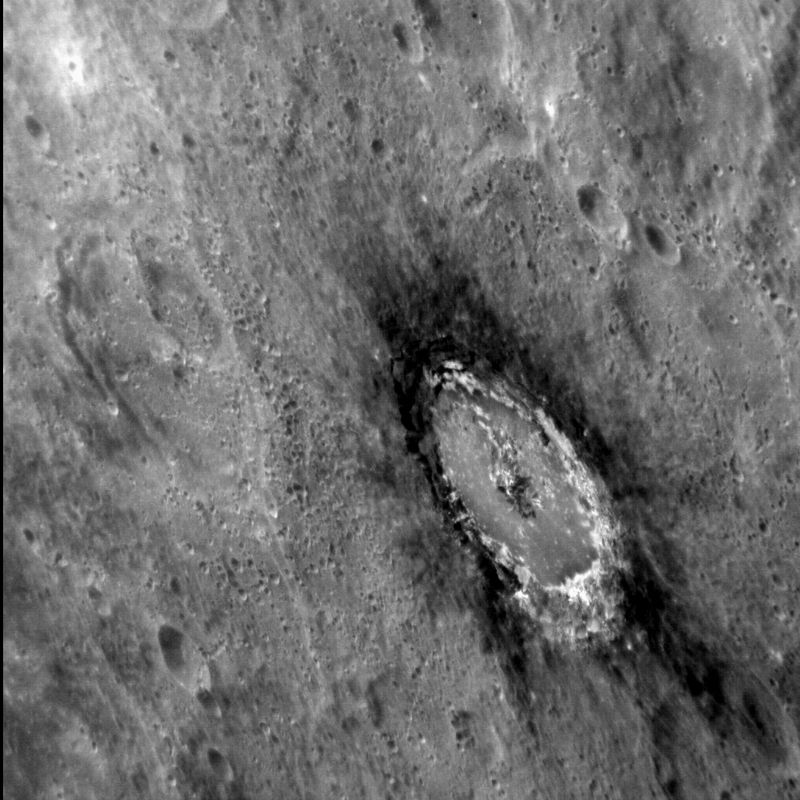 Whatever the darkening agent, the scientists surmised that it was most concentrated in Mercury’s low-reflectance material (LRM), which generally appears as deposits excavated from depth by impact cratering. The researchers examined MESSENGER Neutron Spectrometer measurements of LRM and surrounding materials, and they found that increases in low-energy neutrons are spatially correlated with LRM. Such increases require that the LRM have higher concentrations of an element that is inefficient at absorbing neutrons. Carbon is the only darkening agent suggested for Mercury that is also an inefficient neutron absorber. These measurements were possible only late in MESSENGER’s second extended mission, when the spacecraft regularly passed within tens of kilometers of Mercury’s surface — a necessary condition to resolve LRM deposits with the Neutron Spectrometer. Prior measurements acquired at altitudes greater than 200 kilometers couldn’t resolve such deposits. The data used to identify carbon included measurements taken just days before MESSENGER impacted Mercury in April 2015. “The global mapping of LRM shows that its source regions must typically lie deep within Mercury’s crust, because the deposits are brought to the surface only by large impact craters,” said coauthor Rachel Klima, a planetary geologist at APL who was instrumental in analyzing the multispectral image data to identify occurrences of LRM. These findings not only directly test hypotheses for how Mercury’s earliest crust formed but also provide clues about the volatile composition of the material from which Mercury accreted, “which in turn tells us about the distribution of material in orbit about the Sun during solar system formation,” Klima said. Planetary scientists said there are still many big questions to be answered. For one, what are the other minerals that make up Mercury’s crust? “We have some ideas from elemental data from MESSENGER’s X-Ray Spectrometer and Gamma-Ray Spectrometer, but because the surface is so low in iron we cannot use visible and near-infrared spectra to probe the mineralogical composition of surface materials in the way we normally do for other rocky bodies,” Klima said. Additional coauthors on this paper include APL’s David Lawrence, Carolyn Ernst, Brett Denevi, John Goldstein and Scott Murchie; Elizabeth Frank and Larry Nittler, of the Carnegie Institution of Washington; and MESSENGER Principal Investigator Sean Solomon, of the Lamont-Doherty Earth Observatory, Columbia University. The Johns Hopkins University Applied Physics Laboratory built and operates the MESSENGER spacecraft and manages this Discovery-class mission for NASA. The Laboratory for Atmospheric and Space Physics (LASP) in Boulder contributed the Mercury Atmospheric and Surface Composition Spectrometer (MASCS).